Ing.arch. Zuzana Cambelova graduated at the Technical University, Faculty of architecture, Bratislava, in 1985. She is a member of Slovak Chamber of Architects. 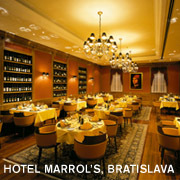 In the year 2003 she was nominated for the prize of Dušan Jurkovič as the author of hotel Marrol's.